Cold Case Department To Open In Local Cop Shop. Hopefully. Hello. I’m very pleased to announce that due to a severed finger (see above) having been found in a frosty local verge I may at long last get transferred from my desk job. Yes, yours truly may get back to operational status and open, what we in the force like to call, “a cold case department” (any case that involves a bit of outdoorsy detective work during winter). I’m well up for the job and love finding body parts as I’m not squeamish. If anyone wants to email my bosses and suggest I get back on active detective duty please do. Yours, PC Cowgrove. Beckworth Police. Hello. I’m very pleased to announce that for the first time in years trick or treating is to be tolerated in Beckworth this Halloween night. You may remember that it was banned due to year on year increases of muggings by under 10s on the town’s population. A compromise has been reached whereby youths will be accompanied door to door by armed riot police and not allowed to look, or act, too scary. I trust this will enhance everyone’s enjoyment of all-hallows eve. Yours, PC Cowgrove. Beckworth Police. Hello. Great news for all those who have been following the horrific Stag Do Massacre case this year, probably the most important clue has just been found. And in the nick of time too… My bosses were on the verge of closing the case (as no body has yet been found) when I got a tip-off from some kids that they’d found a severed hand. As there was no time to lose PC Rozzer (my doggy assistant) and I took a gentle stroll in the rain to where the detached limb was last spotted. Lucky for us the clue was found in the waxworks museum, and so after paying the entrance fee we were able to spend a couple of hours larking about with effigies of the famous before getting down to detective work. We sealed off the crime scene, dusted for prints and took some very funny selfies shaking hands with the hand which we will put on instagram. 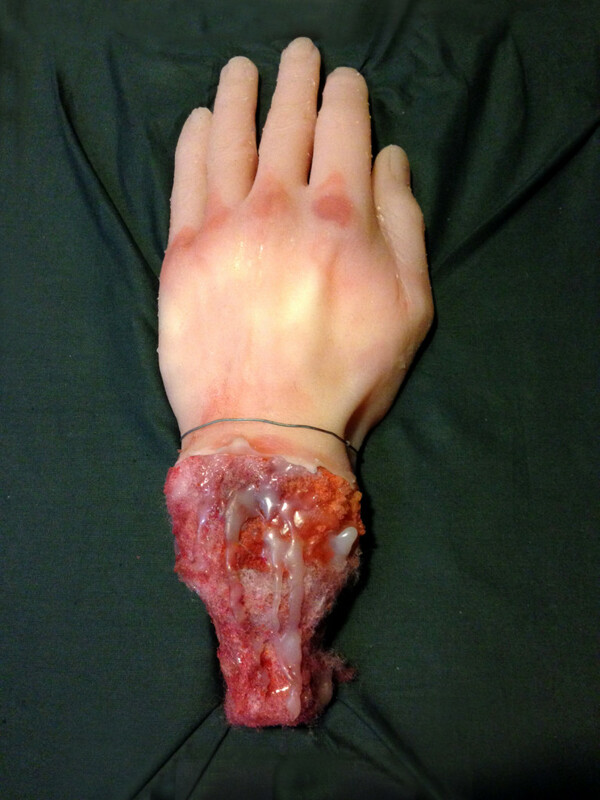 It has a very strong grip and is very distinctive as it has a very thin wire bracelet wrapped around the wrist. 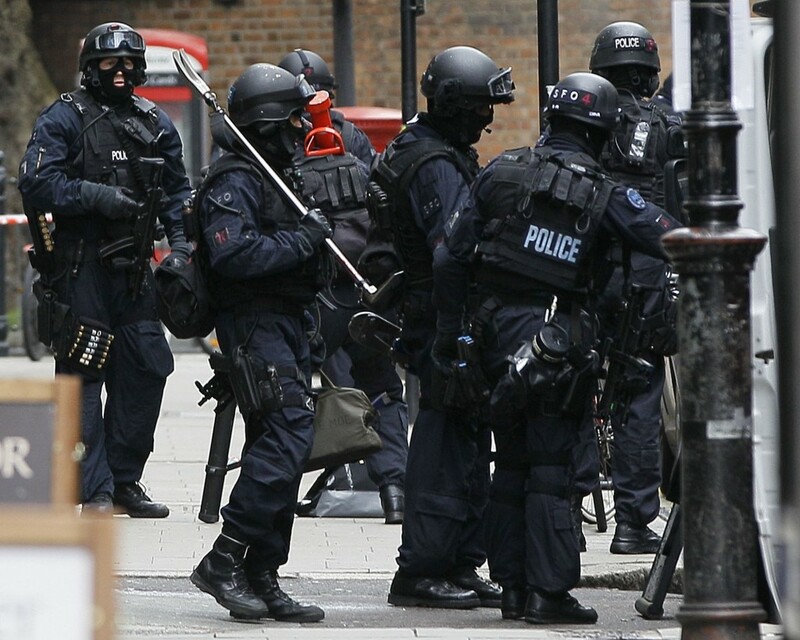 After the anti-terrorist bomb squad have finished “making it safe” by blowing it up, we’ll be able to see if it’s a left hand, or right, or comes from a bloke or lady. 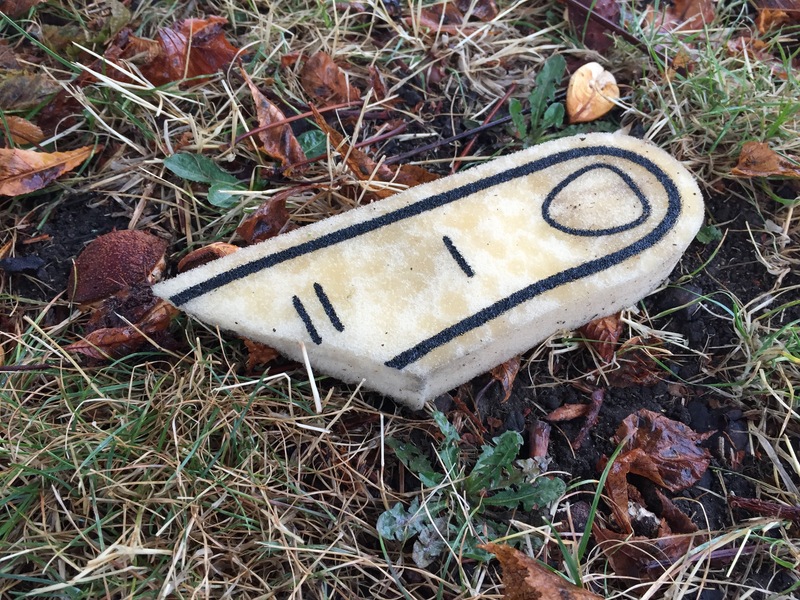 It’s obviously connected to the Stag Do murder, but we’re not sure how. And that’s where you, Joe and Joanna Public, can help… Maybe you know someone with a criminal past or bad temper who has mislaid a hand and could be a murderer? Possibly you saw the owner of said palm and digits drop them in the museum whilst they looked around during a stag do? Or maybe you look like a waxwork of someone famous? If so CID would like to hear from you. Please ring 999 and ask for PC R Cowgrove at Beckworth Police station. PC Rozzer and I are currently working reduced hours as we’re getting the station ready for Christmas but feel free to leave a message on the answer phone. I’ll keep you posted on further murder developments in between making paper chains and drinking mulled wine. Yours, PC Cowgrove. Beckworth Police. Hello. I don’t know about you but I’ve had a fantastic autumn so far. Due to stress I’ve had months off from work and so have enjoyed catching up on all the things you promise to do when you’ve got lot’s of time off. Like joining a pub’s dart team. It may not be the best team in the county, in fact we’re ranked bottom of the league, but it’s the taking part that counts. That and the heavy drinking. Almost every night we were out. My dartsmanship didn’t improve but my reliance on alcohol went off the scale. Sadly all things come to an end, and being banned from most pubs in the area has coincided with me returning to police duties. So i’ve handed in my darts. But as luck would have it my first week back at work has me striking rich. 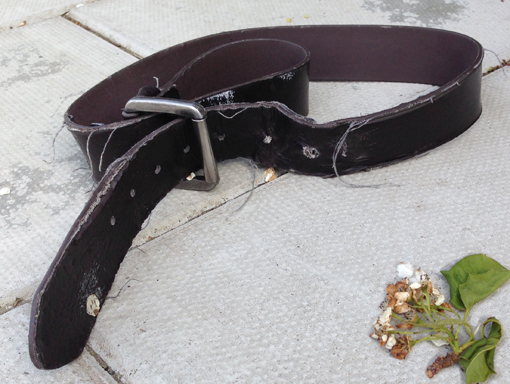 After a four month clue-famine today PC Rozzer and I have found a tantalising bit of Stag Do Massacre evidence whilst out on the beat. 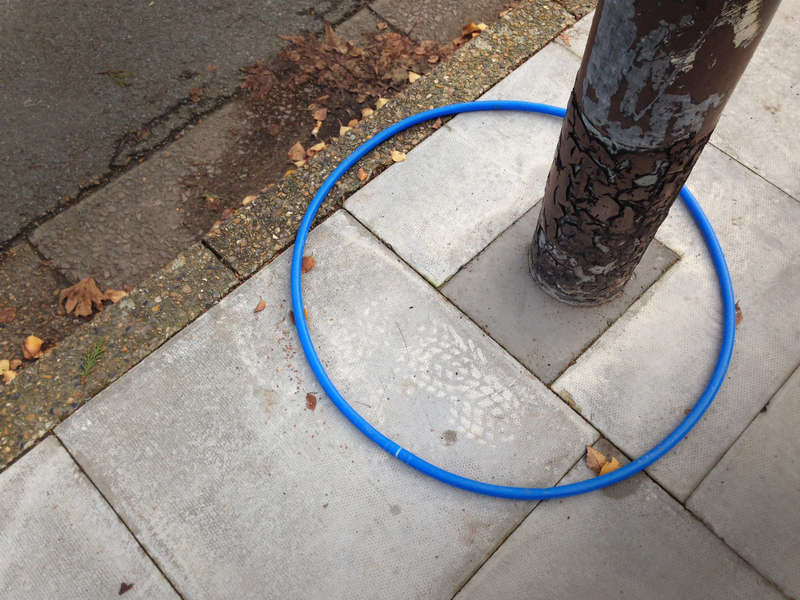 A shiny blue plastic hula-hoop. Interestingly it has been left wrapped around a lamp-post, so the owner must have been tall enough to hoop it neatly over the top. And this is where you, the general public, can help. Maybe you know a 12′ tall could-be murderer, or someone with a ladder, who’s a champion hula-hooper and has lost their prized hoop? Perhaps you’ve seen a dodgy magician pass hula hoops through solid objects? Or is it a hoola-hoop at all, maybe it’s a sleeping snake? If you know get in touch… Of course the hoop may be totally irrelevant to the murder case (and my superiors have said that about all the clues i’ve found so far) in which case we can remove it from our enquiries. Still, it’s a relief to find something. My boss has said if i don’t find clues, or suspects, or the murder victim by Christmas they will wrap up the case as unsolved, or as not having happened… and we can’t have that. But if the great British public could plant some clues you’d be keeping me and Rozzer in a job, so please spread the word. And once a clue has been left, somewhere easy for me to find, please ring 999 and ask for PC R Cowgrove at Beckworth Police station. If you don’t catch me or PC Rozzer at the station leave a message, or better still join us at the bus-shelter where we’ve taken to having a can of strong lager or five during quiet moments. I’ll keep you posted on murder developments when I can. Yours, PC Cowgrove. Beckworth Police. Hello. I’ve had an interesting couple of months whilst I was suspended from duties, I had a well earnt holiday in Ibiza and caught up on daytime telly. I occasionally attended court due to being the arresting officer (and unofficially the lead detective) in the obscene vegetable case. But now that’s finished i’m back out on the beat looking for clues in the Stag Do Massacre case. PC Rozzer has tried his hardest running the case single-handed (or pawed as he’s a dog) but he’s only unearthed bones so far. If you do find any clues CID would like to hear from you. Please ring 999 and ask for PC R Cowgrove at Beckworth Police station, but you may not catch me in as PC Rozzer and I are currently trying to get fit and have taken up jogging. But I’ll keep you posted on murder developments when I can. Yours, PC Cowgrove. Beckworth Police. Hello, if you excuse the pun the Stag Do Massacre case is really hotting up. 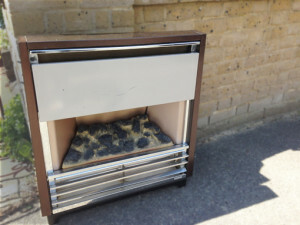 Well, it’s not really but we’ve found a discarded heater in the street near the Police station. PC Rozzer and I were having a late night wander and literally fell over it. It’s most likely part of the fixtures and fittings from the club where the murder took place and due to being violently removed is bound to be covered in the gang’s dabs (finger prints). The fire is currently being destroyed by the anti-terrorist bomb-squad (as they believe it to be a health hazard), but once they’ve finished with it we’ll dust the remains for clues. But we also need the public’s help with this case, and that’s where you come in. Perhaps you’ve seen a gang of blood covered men carrying radiators, thermostats, maybe even a boiler? Have you seen groups of criminals trying to flog night storage heaters? Or maybe you know a thing or two about getting the “fake log” bit on old electric fires to light up like flames? If so CID would like to hear from you. Please ring 999 and ask for PC R Cowgrove at Beckworth Police station, but you may not catch me in as PC Rozzer and I are currently working reduced hours as we’re trying to get suntans. But I’ll keep you posted on murder developments when I can. Yours, PC Cowgrove. Beckworth Police. Hello, just a quick update on the horrific Stag Do Massacre case. PC Rozzer (my doggy assistant) has been sniffing around looking for clues and unearthed a very large blue clue this morning. 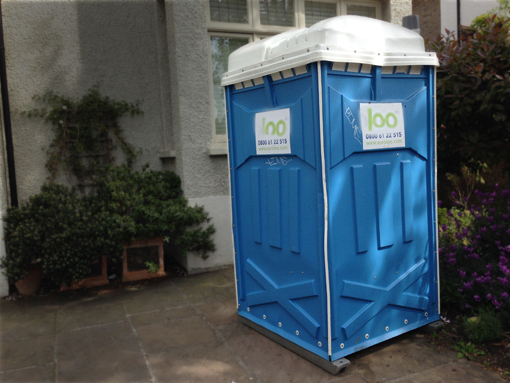 To the untrained eye it looks like a very small porta-cabin, but as it could only hold a couple of people at a time i’m inclined to think it is something else. I’ve no idea what it could be but while i try and suss that out the anti-terrorist bomb-squad will remotely destroy it (as they believe it to be a death trap). It’s some how connected to the Stag Do murder, maybe a couple of gang members are hiding in it? Possibly it’s the stripper’s changing room she used prior to entertaining the gang? If you have any knowledge about small blue portable buildings then CID would like to hear from you. Please ring 999 and ask for PC R Cowgrove at Beckworth Police station. PC Rozzer and I are currently working part-time as we’ve got the Beckworth Country Show coming up and we want to enter some veg in the allotment show. I’ll keep you posted on murder developments. Yours, PC Cowgrove. Beckworth Police. Blimey, it seems like months since I had anything to report re: the horrific Stag Do Massacre case. PC Rozzer (my trusty four legged assistant) was supposed to be all over this crime but he has been chasing his tail and the only leads he’s dug up are dog leads. Whilst all the time I was laid up for a few weeks nursing an ingrowing toenail and watching daytime telly. Anyway, here I am on my first day back at work and a new clue lands on my desk. Literally. 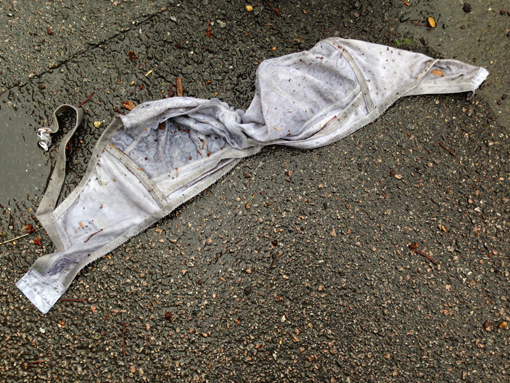 A wet and soggy large grey women’s bra was found, and photographed, by a vigilant member of the public. But rather than leave it where it was he stupidly brought it into the Police Station, so inconveniently my office is currently cordoned off whilst the anti-terrorist bomb-squad remotely destroy the bra as they believe it to be booby trapped (no pun intended). This “large” clue, was obviously left by the stripper after she’d finished her act entertaining the criminal gang on their stag night. We’re guessing she has been taken hostage by the 30 strong gang although they have yet to issue any demands. My guess is they don’t have any stamps with which to post it. And this is where you can help. Perhaps you have been approached by criminals wanting to buy first-class postage? Maybe you know someone who’s worked as a stripper and has lost the upper part of their stage outfit? Or possibly, you like me, you are wanting to know what is happening in Neighbours? If so CID would like to hear from you. Please ring 999 and ask for PC R Cowgrove at Beckworth Police station. PC Rozzer and I will be handling this mass murder case as we slowly get back to work, without the use of an office. I’ll keep you posted on developments. Yours, PC Cowgrove. Beckworth Police. Hello. PC Rozzer and I have just come back from a well-earned half-term holiday break at Centerparks to find we’ve been left another clue in the nefarious Stag Do Massacre case. We’d hardly had time to unpack when an observant street sweeper knocked on our door to say they’d found something of interest. 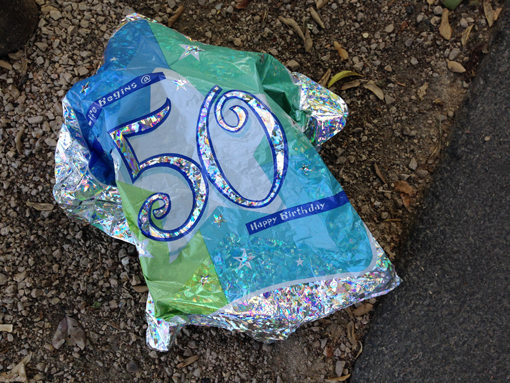 PC Rozzer of course thought it was a juicy bone so was disappointed to find it was a discarded Fifty Year Old Baloon left on the pavement outside WHSmiths. The shop is currently cordoned off whilst the anti-terrorist bomb-squad remotely destroy the balloon, as they believe it to be booby trapped. This “half term” clue, was obviously left by the Groom’s Uncle Ted who celebrated his half century before the stag night out went wrong and turned to murder. We’re guessing he wants to “come in from the cold” and join a witness protection programme after giving damning evidence against the rest of the 30 strong gang. And this is where you can help. Perhaps you know someone on the witness protection programme? Maybe you’ve stumbled on their true identity and want to blackmail them? Or perhaps, you like me, you just want to take a shower to remove all the suntan lotion from holiday? If so CID would like to hear from you. Please ring 999 and ask for PC R Cowgrove at Beckworth Police station. PC Rozzer and I will be handling this mass murder case as we slowly get back into the swing of work. I’ll keep you posted on developments. Yours, PC Cowgrove. Beckworth Police.